Protoclassic Period of the West Mexican sculptural tradition (100 B.C. to A.D. 250). 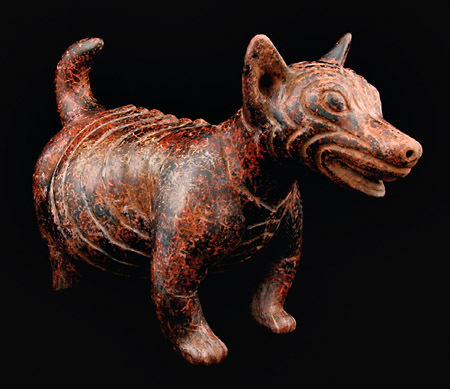 This hollow standing Colima Dog effigy figure, with burnished red slip and unique deeply incised features, ears in rigid alertness, has almond-shaped incised eyes, a ribbed body with detailed vertebrae, supported by sturdy legs, and sporting a solid upward curling tail. The expressive stance frames the masterful modeling, exhibiting as a monument to this ancient sculptor. The highly burnished surface is richly mottled overall with manganese oxide deposits and root markings within the beautiful patina. Condition: This dog is in unbroken and excellent condition. Provenance: From an early 20th Century Los Angeles Gallery.